The next time you’re snuggled up in bed for a marathon viewing of Breaking Bad or House of Cards, an extra set of eyes may be watching you, counting the bits of data that stream to your TV—and soon they could be charging you extra for all that streaming video. This is no mere dystopian fantasy: If you’re a data-heavy user fond of Netflix, Pandora, and YouTube, chances are good that your bit-gobbling ways are coming under increasing scrutiny from your Internet service provider, and in the near future you may find yourself paying a premium for all those massive downloads and data streams. Earlier this month, Comcast expanded market trials of its “metered” broadband plans, and analysts say it’s only a matter of time before all U.S. carriers join their European counterparts in charging heavy data users a premium for their consumption. In essence, your Internet use will be treated like your electricity or water use: You’ll begin paying for exactly what you use, and “all you can eat” plans will disappear. Over the past few years, AT&T, Comcast, and Time Warner have experimented with data caps and broadband metering to some extent. Time Warner kicked off the trend with an attempt in 2009 to cap customers at 5GB per month in exchange for a $5 rate cut, and was soundly rebuked by the marketplace. Comcast has since experimented with a similar plan on an opt-in basis in select markets, while simultaneously testing tiered data caps based on the speed of service a customer buys. In recent weeks Comcast has expanded the program to new trial markets in Huntsville and Mobile, Alabama. Meanwhile, AT&T has already adopted usage caps for its residential customers. As we get more and more of our entertainment, such as the Netflix show ‘Derek,’ from the Internet, we may have to start watching our broadband usage closely. Your ISP probably will be. In response to vocal outrage from consumers, the big ISPs have hesitated to roll out new metered billing plans nationwide. Still, say industry watchers, the clampdown is coming. What is it, and should you care? Buying broadband service used to be a one-size-fits-all affair, where you paid a fixed price for unlimited bandwidth. But in recent years the big ISPs have begun imposing data-usage caps, ostensibly to deal with a small group of subscribers who consume massive amounts of data yet pay the same as everybody else. The ISPs may be following in the footsteps of the wireless industry by creating service tiers that offer varying amounts of data per month. Heavy data users would have to buy a more expensive tier to keep up their data-gorging ways. The ISP tracks (“meters”) the customer’s data usage and then charges for each additional gigabyte of data the customer uses beyond the monthly allotment. Depending on the carrier, usage caps can vary from 150GB to 300GB. On AT&T, residential high-speed Internet customers already have a cap of 150GB, and U-Verse Internet subscribers have a cap of 250GB. Meanwhile, Comcast is experimenting with caps ranging from 300GB to 600GB, depending on the service tier. Whether metered billing is a problem depends entirely on the kind of Internet user you are. By all available measures, the overwhelming majority of broadband subscribers won’t see any impact from emerging data caps and metered billing plans, and those in the lowest usage tiers may even see a small discount on their service in the short run. According to Comcast, the current median monthly data usage for its customers is roughly 16GB. AT&T claims that the top 2 percent of its users (in terms of data consumption) eat up 20 percent of its network’s total available bandwidth. Telecom analyst Teresa Mastrangelo, principal at Broadbandtrends, suggests that the 80/20 rule applies, in that 80 percent of the data is going to 20 percent of users. “It may even be closer to 90/10,” Mastrangelo says. But Mastrangelo questions why any ISP would risk angering its whole subscriber base by imposing caps and metering to deal with the heavy usage patterns of just a few. And having a data cap that exceeds a typical user’s consumption by 600 percent seems, to her, a strange way to address the problem, Mastrangelo says. ISPs cite self-defense, pointing to the extreme volume of data some users consume. For example, in August of this year, Verizon cracked down on one FiOS user whose monthly consumption amounted to more than 38 terabytes. That’s per month. Without some kind of data cap, says one ISP spokesperson, providers have no way of cracking down on abusers. Comcast has been leading the charge toward usage-based broadband pricing. But DSLReports’ Bode says the fairness argument is bogus, because American consumers already pay “more than their fair share” for bandwidth. Besides, says Bode, the heavier users already pay more than light users, because they typically pay for faster tiers of service. “It’s effectively a rate hike wearing lipstick,” he quips. But the data hogs may not be the real reason ISPs are warming us up to their metered billing approach. They may be slowly getting into position to reap maximum profits in a future in which home broadband service is way faster, and in which we’re using way more of it. The average consumer today uses about 16GB of data per month, but that number has risen sharply over recent years. In 2009, the average consumer used just 9.7GB, according to estimates from the networking equipment provider Cisco. And a growing segment of the population is streaming Netflix to their living rooms while surfing the Web, streaming music to their tablets, and playing online games such as World of Warcraft. According to Netflix’s published bandwidth estimates, streaming HD consumes up to 2.8GB per hour. By those numbers, a single tech-savvy person could easily consume 150GB of data just by watching the national average of 50 hours of TV per month via their Netflix account instead of traditional cable. Lest you think this type of user is a small minority, consider that 55 percent of households in the United States now subscribe to some kind of streaming video service. And 88 percent of Netflix users and 70 percent of Hulu users say they have watched three or more TV-show episodes in one day (a practice known as “binging”). 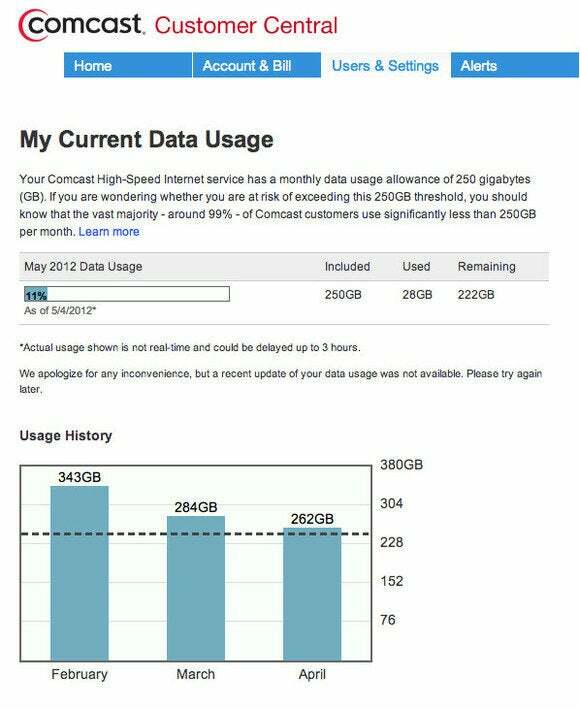 Comcast’s data-usage meter for home broadband service. The new metered pricing structures seem set up for households with big streaming habits. In Comcast’s Tuscon, Arizona market trial, for instance, the highest performance tier comes with speeds up to 105 megabits per second and a 600GB data cap. According to Comcast spokesperson Charlie Douglas, this arrangement is designed to account for the fact that customers with faster connections tend to use more data. The cost for that service? $115 per month, with the option to buy additional bandwidth at a rate of $10 per 50GB increment. There’s a kind of logic behind the premium pricing for streaming-heavy households. After all, Internet-savvy users tend to be more affluent, and have shown a willingness to pay for faster connection speeds. But as streaming services grow in popularity, that premium could hit lower-income families hard as they follow mainstream adoption trends and begin viewing more of their news and entertainment over streaming connections rather than conventional TV broadcasts. The experts we’ve talked to express little doubt that metered broadband, data caps, and premium bandwidth tiers are the future for U.S. Internet subscribers. Nearly every major ISP has adopted some form of cap or metering, though their explanations and policies vary. The cable companies first asserted, like the wireless carriers, that data caps and metering were necessary to prevent network congestion. But they have since admitted that the usage caps really have nothing to do with network congestion problems. Could it be that they’re simply creating the impression of scarcity around a commodity in order to increase its perceived value? If that is so, such a practice is especially dangerous in a market that has already been designed to eliminate competition (the cable companies have divided up the markets in the United States), because there’s simply no counterweight to hold prices down. The best advice for anyone worried about how broadband metering may affect them is to start tracking your own monthly data consumption. If your ISP offers a broadband-metering tool without forcing you to accept a data cap for its use, give it a try. Stream a TV episode and a movie on Netflix or Amazon, and note how much data it uses up. Try the same with movies or music downloads. Knowing what kinds of data cost you the most bandwidth is a good idea. With an understanding of your consumption, you’ll be ready to make an informed buying decision when your provider eventually comes knocking to offer metered billing plans. It may be only a matter of time before today’s education programs, soft caps, and market trials become the hard-and-fast service plans for all users.